Elizabeth Riley’s video works address questions surrounding the complex relationship between our lived reality and its digital manifestations. The Life of a City follows the timeline of a modern cityscape—from a primordial, prehistoric realm up to the contemporary bustle of a cosmopolitan metropolis. The video opens with a series of abstracted, undulating patterns set in motion by the fervor of creativity and innovation that propels civilization. As the city slowly takes form, each building is delineated by its own frenetic designs. Employing a range of colors to signify the natural elements and materials derived for construction, the structures shift and fade into place to establish a universal skyline. 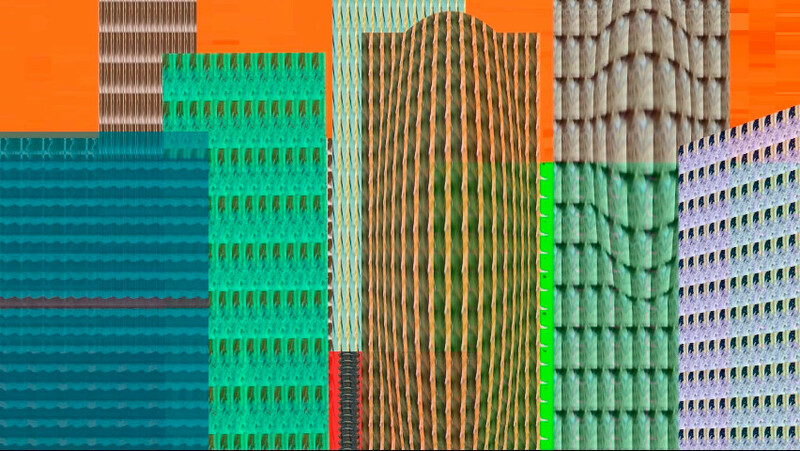 By rendering the evolution of the city in an abstracted manner, Riley refers to the new reality of digital cityscapes. In an increasingly globalized world, geographic distances shrink and any built environment can be experienced virtually. While Riley’s video speaks to the growth and accessibility of any major city, the work’s setting at BRIC calls attention to the vast amount of development and movement perpetually occurring in Downtown Brooklyn. By allowing the video to fade out while the buildings are still constantly altering their facades, Riley proffers the notion that industrial and societal innovation continues indefinitely. Riley’s work has been shown at BRIC, chashama, and Sideshow Gallery, all in Brooklyn; Project ARTspace and AC Institute, both in NY; and Knockdown Center, Queens. She has received fellowships from Two Trees Cultural Space and BRIC, both in Brooklyn, and she has completed residencies in I-Park Foundation, East Haddam, CT; Heliker-LaHotan Foundation, Great Cranberry Island, ME; Anderson Center, Red Wing, MN; and the Association of Icelandic Visual Artists, Reykjavik, Iceland. She received her BA from Barnard College and her MFA from Hunter College, both in New York, NY. Elizabeth Riley is a 2017-18 recipient of the ArtFP, an open call for Brooklyn-based visual artists to exhibit at BRIC House. For more information, visit BRICartsmedia.org/ArtFP.